This touches somewhat on Mari-Lou A's recent post referring to tiny edits. I often see teeny-tiny edits, where a word or phrase was italicized, while ignoring rip-roarers. I prefer more rather than less to follow rules. If the edit option states make it substantial, I'll edit everything that needs it: capitals, spacing, grammar mistakes that don't include the example, etc. It will usually come off as an intelligible question with a flaw-filled example. Most people have been gracious about the edit, just as I am grateful to people who edit out my stupid mistakes. I looked through meta and didn't find a definitive answer to my question: should we polish the English of our OPs? If so, to what degree (it must not invalidate or answer the question, obviously)? Edited to add: some of my own posts have been edited. I'm grateful for the folks who correct my stupid mistakes. However, once I actually had a user (you know who you are) who edited a slightly amusing comment out of my post explaining (he) felt grumpy today. I didn't know what a roll back was at the time. Is this kosher? How much is too much, how much not enough? I have long since given up saying "thanks", or "hope this helps" in my posts. I know it's fine to remove those from OP's posts, but there is usually more to do. My question is: what's going too far (not including changing meaning). (Bear with me, I have to answer the question about an edit being too small before I can answer the real question ...) The entire purpose to editing large or small is to improve the quality of a post. Am I improving this post? Any post that is made more readable: punctuation added, capitalization fixed, spelling fixed, etc. is improved. For example: It is well known that posts with proper titles get answered much quicker than posts with nonsensical ones. So, if you were to improve nothing but the title of a post, have you improved the post? If the answer is yes, then you've made a valid edit. It just might not be the final edit the post requires. The counter-point to this argument is: But, haven't you left the work undone? Does this invalidate the edit you made above? I would posit, no. It is still a valid edit that has improved the post. Ideally you would, of course, improve the entire post. But, there are times when you just don't have the free time to do so. So, any improvement is an improvement. So, getting to the point: The same question needs to be asked about a large edit. Are you improving upon the OP, or merely changing their entire post to suit a question you wish had been asked? If a question that has been asked borders upon gibberish due to grammatical errors, punctuation errors, or any other manner of glaring issue, then it comes down to a question of whether it needs closure vs. can it be salvaged. If you believe you can salvage the question without significantly changing the OP's question, then go ahead and edit the hell out of it. If you believe you are rewriting the whole thing to the point where it would no longer be recognizable, then vote to close for Low-Quality or Unclear What You Are Asking. My question is: what's going too far (not including changing meaning). Bad edits (not including changing meaning) are those that actively engage in opinion wars. This would include issues of style* (e.g. 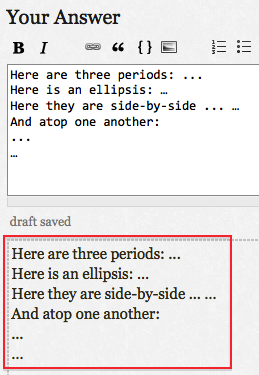 fancy quotes versus apostrophes; ellipses versus three periods) or issues of dialect/region (e.g. full stop versus period; removing "u" from colour). I will remove "amusing" content if I find it distracting or irrelevant or borderline trolling. Users have a bad habit of upvoting amusing content instead of helpful content and certain users use this to fish for cheap upvotes. But a change of this type is not typically "large" enough for me to consider editing the post. If I am in there making other edits, however, I take the opportunity to remove chaff — amusing or otherwise. That being said, I consider any image that is not absolutely necessary to be bad. Images are almost always unnecessary unless they are providing additional context or have a very good signal to noise ratio. * I have to admit I do make some of these changes myself because the site so overwhelmingly uses three periods for ellipses and apostrophes instead of fancy quotes. But I shouldn't and am starting to just leave them alone.